35 U.S.C. 122 includes two provisions regarding submissions by third parties in patent applications. Pursuant to 35 U.S.C. 122(c), no protest or other form or pre-issuance opposition may be initiated after publication of an application without the express written consent of the applicant. 35 U.S.C. 122(c) is implemented by 37 CFR 1.291. For information on protests see MPEP § 1901. 35 U.S.C. 122(e), on the other hand, provides a mechanism for third parties to submit printed publications in another party’s patent application. Under 35 U.S.C. 122(e), any third party may submit printed publications of potential relevance to the examination of an application for consideration and inclusion in the record of the application. Such submissions must be timely made in writing and include a concise description of the asserted relevance of each publication submitted, any fee prescribed by the Director, and a statement of compliance with 35 U.S.C. 122(e). 35 U.S.C. 122(e) is implemented by 37 CFR 1.290, which replaces 37 CFR 1.99. See Changes To Implement the Preissuance Submissions by Third Parties Provision of the Leahy-Smith America Invents Act, 77 Fed. Reg. 42150 (July 17, 2012) (final rule). Third-party submissions under 37 CFR 1.99 were eliminated as of September 16, 2012. In contrast to protests under 37 CFR 1.291, third-party submissions under 37 CFR 1.290 may be made in published patent applications where the timing provisions set forth in 37 CFR 1.290(b) are satisfied. Additionally, third-party submissions have different content requirements than protests. While 37 CFR 1.290 limits third-party submissions to printed publications, 37 CFR 1.291 provides for the submission of information in a protest other than publications, including any facts or information adverse to patentability, and arguments to that effect. See MPEP §§ 1901, 1901.02 and 1901.06subsection VII. Moreover, 37 CFR 1.291(c)(2) requires a protest to include a “concise explanation of the relevance” of each item of information submitted. This is distinct from the concise description of relevance required by 37 CFR 1.290(d)(3) for third-party submissions. Unlike the concise description of relevance for a third-party submission under 37 CFR 1.290, which is limited to a description of a document’s relevance, the concise explanation for a protest under 37 CFR 1.291 allows for arguments against patentability. Despite the provisions of 35 U.S.C. 122(c) and (e), the Office occasionally receives third-party inquiries or submissions (other than under 37 CFR 1.290 and 37 CFR 1.291) regarding patent applications. For example, third parties have inquired into the timing of future actions on an application, inventorship in an application, and some third parties have insisted that the Office withdraw an application from issue under 37 CFR 1.313 on the basis of unpatentability of a claim. The Office considers inappropriate any third-party inquiry, or submission in an application that is not provided for in 37 CFR 1.290 or 37 CFR 1.291. Any submission filed by a third party in an application that does not comply with the requirements of 37 CFR 1.290 or 37 CFR 1.291 will not be entered into the application file and will be discarded. The provisions of 35 U.S.C. 122(c) and (e) limit a third party’s ability to protest, oppose the grant of, or have information entered and considered in an application pending before the Office. However, these provisions do not limit the Office’s authority to independently re-open the prosecution of a pending application on the Office’s own initiative and consider information deemed relevant to the patentability of any claim in the application. See Blacklight Power, Inc. v. Rogan, 295 F.3d 1269, 63 USPQ2d 1534 (Fed. Cir. 2002). 37 CFR 1.290 Submissions by third parties in applications. (a) A third party may submit, for consideration and entry in the record of a patent application, any patents, published patent applications, or other printed publications of potential relevance to the examination of the application if the submission is made in accordance with 35 U.S.C. 122(e) and this section. A third-party submission may not be entered or considered by the Office if any part of the submission is not in compliance with 35 U.S.C. 122(e) and this section. (ii) The date the first rejection under § 1.104 of any claim by the examiner is given or mailed during the examination of the application. (c) Any third-party submission under this section must be made in writing. (ii) The submission complies with the requirements of 35 U.S.C. 122(e) and this section. (4) Non-patent publication by author (if any), title, pages being submitted, publication date, and, where available, publisher and place of publication. If no publication date is known, the third party must provide evidence of publication. (f) Any third-party submission under this section must be accompanied by the fee set forth in § 1.17(o) for every ten items or fraction thereof identified in the document list. (g) The fee otherwise required by paragraph (f) of this section is not required for a submission listing three or fewer total items that is accompanied by a statement by the party making the submission that, to the knowledge of the person signing the statement after making reasonable inquiry, the submission is the first and only submission under 35 U.S.C. 122(e) filed in the application by the party or a party in privity with the party. (h) In the absence of a request by the Office, an applicant need not reply to a submission under this section. (i) The provisions of § 1.8 do not apply to the time periods set forth in this section. Section 8 of the America Invents Act (AIA) amends 35 U.S.C. 122 by adding 35 U.S.C. 122(e), which provides a mechanism for third parties to submit printed publications in another party’s patent application. 35 U.S.C. 122(e) is implemented by 37 CFR 1.290, which replaces 37 CFR 1.99. See Changes To Implement the Preissuance Submissions by Third Parties Provision of the Leahy-Smith America Invents Act, 77 Fed. Reg. 42150 (July 17, 2012) (final rule). Third-party submissions under 37 CFR 1.99 were eliminated as of September 16, 2012. Thus, a third-party submission cannot be filed in an application where a notice of allowance has been issued in the application, regardless of whether that notice of allowance is subsequently withdrawn. If a notice of allowance has not been issued in an application, a third-party submission may be filed prior to the date that is six months after the date of publication by the Office or prior to the date of the first rejection of any claim by the examiner, whichever is later. The 37 CFR 1.290(b)(2)(i) time period will be initiated only by publications “by the Office” under 35 U.S.C. 122 and 37 CFR 1.211, and will not be initiated by a publication by the World Intellectual Property Organization (WIPO). Thus, an earlier publication by WIPO of an international application designating the United States will not be considered a publication that will initiate the 37 CFR 1.290(b)(2)(i) time period for an application which entered the national stage from the international application after compliance with 35 U.S.C. 371. Additionally, the first publication of the application by the Office will trigger the 37 CFR 1.290(b)(2)(i) time period where appropriate. The republication of an application under 37 CFR 1.221(b) is not the “first” publication by the Office under 35 U.S.C.122(b) for purposes of 35 U.S.C. 122(e). Where the Office does not publish an application, the date that is six months after the publication date would not occur and, therefore, by default would be considered later than both the date of a first rejection of any claim and the date the notice of allowance is given or mailed in the application. Accordingly, the date that a notice of allowance is given or mailed in the application would control the timing of a third-party submission in an application which has not been published, not the date of the first rejection of any claim. The 37 CFR 1.290(b)(2)(ii) time period will be initiated by the date the first rejection under 37 CFR 1.104 of any claim by the examiner is given or mailed during the examination of the application. “Given” refers to the electronic notification of an Office action that replaces postal mailing of an Office action for applicants participating in the Electronic Office Action Notification (e-Office Action) program. The 37 CFR 1.290(b)(2)(ii) time period will not be initiated, for example, by a first Office action that only contains a restriction requirement or where the first Office action is an action under Ex parte Quayle, 1935 Dec. Comm’r Pat. 11 (1935). The filing of an RCE does not reset the 37 CFR (b)(2)(ii) time period for filing a third-party submission. Additionally, the filing of an RCE in an application does not preclude a third party from making a third-party submission in the application, if the third-party submission is made within the time periods set forth in 37 CFR 1.290(b)(2). All third-party submissions must be filed prior to, not on, the dates identified in 37 CFR 1.290(b)(1) and (b)(2). For example, assuming no notice of allowance has been issued in an application, if a third-party submission is filed on the same date the first rejection is mailed and the application has been published for more than six months, the submission would not be timely and would not be entered. In another example, assuming no notice of allowance has been issued in an application, if a third-party submission is filed on the date that is six months after the date the Office published the application and a first rejection has already been mailed, the submission would not be timely and would not be entered (i.e., if the Office published the application on May 21, a third-party submission filed on November 21, which is the date that is six months after the date the Office published the application, would not be timely as, according to the rule, the submission would need to have been made on November 20 or earlier). The time periods provided for in 37 CFR 1.290(b) are statutory and cannot be waived. See 35 U.S.C. 122(e)(1). Thus, the Office cannot grant any request for extension of the 37 CFR 1.290(b) time periods. Third-party submissions that are not timely filed will not be entered or considered and will be discarded. The statutory time period for making a third-party submission will not be tolled by a non-compliant submission. Accordingly, making a third-party submission at the earliest opportunity increases the likelihood there will be sufficient time to make a resubmission should the initial submission be found non-compliant. A third party who previously filed a non-compliant submission may file another complete submission, provided the statutory time period for filing a third-party submission has not closed. The abandonment of an application will not toll the statutory time period for making a third-party submission. For example, if prior to publication an application goes abandoned because the applicant fails to timely respond to a first rejection of any claim, and the application is later revived, a third-party submission would be timely if made prior to the earlier of: the date a notice of allowance is given or mailed or the date that is six months after the date the application is published by the Office. A third-party submission under 37 CFR 1.290 is filed on its date of receipt in the Office as set forth in 37 CFR 1.6. The holiday/weekend rule set forth in 37 CFR 1.7(a) applies to a third-party submission under 37 CFR 1.290. For example, if the day prior to the date that is six months after publication of an application which has not been allowed but which application was subject to a first Office action including a rejection of at least one claim more than six month previously is a Saturday, the submission may be timely filed on the next business day, e.g., the following Monday via Priority Mail Express® service pursuant to 37 CFR 1.10, hand delivery or preferably via the Office’s dedicated Web-based interface for preissuance submissions. See also Subsection IV.D. below (providing that the certificate of mailing and transmission provisions of 37 CFR 1.8 do not apply, but the United States Postal Service (USPS) Priority Mail Express® service provisions of 37 CFR 1.10 do apply to a third-party submission under 37 CFR 1.290. (F) any required fee or the 37 CFR 1.290(g) statement that the fee exemption applies to the submission. 37 CFR 1.290(d)(1) provides that any third-party submission under 37 CFR 1.290 must include a document list identifying the documents, or portions of documents, being submitted in accordance with 37 CFR 1.290(e). 37 CFR 1.290(e) sets forth the requirements for identifying the items in the 37 CFR 1.290(d)(1) document list. Because 37 CFR 1.290(d)(1) provides for an item identified in the document list to be either an entire document or a portion of a document, in the case where a lengthy document contains both information of potential relevance to the examination of the application and other information that is not of potential relevance, a third party may choose to identify only the relevant portion of the document (e.g., one chapter of a textbook) in lieu of the entire document where it is practical to do so. Otherwise, the third party should identify the entire document. When filing in paper, third parties may use form PTO/SB/429 (or equivalent) to prepare the document list in accordance with 37 CFR 1.290(d)(1) and 37 CFR 1.290(e). Electronic filing via the Office’s dedicated Web-based interface for preissuance submissions in EFS-Web is an alternative to paper filing using form PTO/SB/429 (or equivalent). 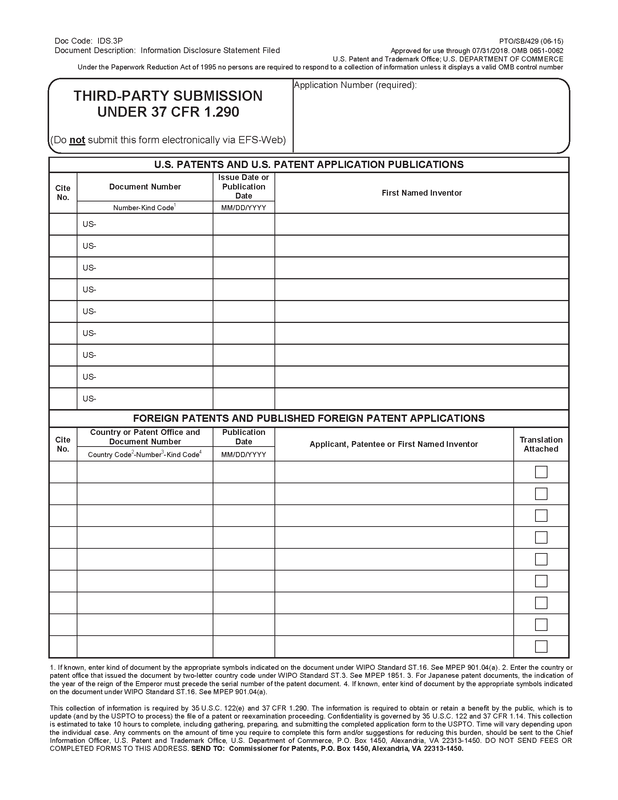 Use of this form will not be necessary for third-party submissions filed electronically via the Office’s dedicated Web-based interface for preissuance submissions, as this interface will prompt the third party to complete the fields that are provided on the form and will automatically format the entered information into an electronic version of the form PTO/SB/429 for electronic submission. While use of form PTO/SB/429 is not required for paper submissions, form PTO/SB/429 is designed to help ensure that important requirements are not overlooked, such as the document listing requirements pursuant to 37 CFR 1.290(e) and the required statements pursuant to 37 CFR 1.290(d)(5). The form PTO/SB/429 also enables the third party to indicate whether a fee is due or to select the “first and only” statement pursuant to 37 CFR 1.290(g) where the fee exemption applies. Form PTO/SB/429 and instructions for completion are available on the USPTO website at www.uspto.gov/forms. 37 CFR 1.290(e) sets forth the requirements for identifying the items in the document list pursuant to 37 CFR 1.290(d)(1). Section 1.290(e) requires the document list include a heading that identifies the list as a third-party submission under 37 CFR 1.290. 37 CFR 1.290(e) also requires that the document list identify on each page of the list, the application number (i.e., the series code and serial number) of the application in which the submission is being filed. This requirement is consistent with the requirement set forth in 37 CFR 1.98(a)(1)(i) for applicant information disclosure statement listings. 37 CFR 1.290(e) further requires that U.S. patents and U.S. patent application publications be listed in a separate section from other items in the document list. Separating the listing of U.S. patents and U.S. patent application publications from the listing of other items in the document list will facilitate printing the U.S. patents and U.S. patent application publications considered by the examiner in a third-party submission on the face of the patent. The dedicated Web-based interface for electronically filing preissuance submissions will automatically generate a document list in accordance with these requirements of 37 CFR 1.290(e). Sections 1.290(e)(1) through (e)(4) set forth the requirements for identifying the items in the 37 CFR 1.290(d)(1) document list. 37 CFR 1.290(e)(1) requires that each U.S. patent be identified by patent number, first named inventor, and issue date. 37 CFR 1.290(e)(2) requires that each U.S. patent application publication be identified by patent application publication number, first named inventor, and publication date. 37 CFR 1.290(e)(3) requires that each foreign patent or published foreign patent application be identified by the country or patent office that issued the patent or published the application; the applicant, patentee, or first named inventor; an appropriate document number; and the publication date indicated on the patent or published application. The requirement for U.S. patents and patent application publications to be identified by first named inventor, and for foreign patents and published patent applications to be identified by the applicant, patentee, or first named inventor, is intended to aid in identifying the items in the document list in the event the application number, publication number, or other appropriate document number data is in error, for example, inadvertently transposed. Further, 37 CFR 1.290(e)(3) offers flexibility in permitting identification of foreign patents and published foreign patent applications by expanding the identification to also include the applicant or patentee, in addition to the first named inventor. All non-patent publications, such as Office actions, journal articles, communications from foreign patent offices, court documents, etc. that qualify as publications should be listed under the “Non-Patent Publications” section of the form PTO/SB/429 (or equivalent) or entered in the “Non-Patent Publications” section of the Office’s dedicated Web-based interface for preissuance submissions when filing electronically. 37 CFR 1.290(e)(4) requires that each non-patent publication be identified by author (if any), title, pages being submitted, publication date, and where available, publisher and place of publication. However, 37 CFR 1.290(e)(4) does not preclude a third party from providing additional information not specified in 37 CFR 1.290(e)(4) (e.g., journal title and volume/issue information for a journal article). Because publisher and place of publication information may not be available in some instances, 37 CFR 1.290(e)(4) emphasizes that such information need only be provided where it is available. For publications obtained from the Internet, the uniform resource locator (URL) of the Web page that is the source of the publication must be provided for the place of publication (e.g., “www.uspto.gov”). Further, for an Internet publication obtained from a website that archives Web pages, both the URL of the archived Web page submitted for consideration and the URL of the website from which the archived copy of the Web page was obtained should be provided on the document listing (e.g., “Hand Tools,” Web page <http://www.farmshopstore.com/handtools.html>, 1 page, August 18, 2009, retrieved from Internet Archive Wayback Machine <http://web.archive.org/web/20090818144217/ http://www.farmshopstore.com/handtools.html> on December 20, 2012). 37 CFR 1.290(e)(4) further requires that, if no publication date is known, the third party must provide evidence of publication. This requirement recognizes that some documents may not indicate a date of publication. Where the actual publication date of a non-patent document is not known, a third party must, at a minimum, provide a date of retrieval (e.g., the date a Web page was retrieved) or a time frame (e.g., a year, a month and year, a certain period of time) when the document was available as a publication for purposes of identifying the document by publication date pursuant to 37 CFR 1.290(e)(4), in addition to including evidence that establishes the document as a publication. See Subsection III.A. below for additional discussion regarding evidence of publication. 37 CFR 1.290(d)(2) requires a concise description of the asserted relevance of each item identified in the document list in view of the statutory requirement of 35 U.S.C. 122(e)(2)(A) that each third-party preissuance submission be accompanied by a “concise description of the asserted relevance of each submitted document.” A concise description of relevance for an item is a statement of facts regarding the submitted evidence (i.e., the patent, published patent application, or other publication) and will not, itself, be treated as evidence. The concise description should set forth facts, explaining how an item listed is of potential relevance to the examination of the application in which the third-party submission has been filed. The concise description of relevance for a listed publication can be presented in any format that would best explain to the examiner the relevance of the accompanying document, such as in a narrative description or a claim chart. A concise description of relevance is most effective when it draws the examiner’s attention to the potential relevance of a submitted document to the examination of an application. A concise description that points out the relevant pages or lines of the respective document may be an effective way to draw the examiner’s attention to the potential relevance of the document, particularly where the document is lengthy and complex and the third party can identify a highly relevant section, such as a particular figure or paragraph. A third party using the Office’s dedicated Web-based interface to electronically file a third-party submission may fill in the concise description of relevance field for an item or upload a separate paper with the concise description for the item in lieu of entering the concise description in the field. See Subsection IV.E. below for more information regarding electronic filing. When filing in paper, a third party should provide the concise description of relevance for an item as a separate paper (as opposed to combining the concise descriptions of relevance for all items into a single paper). Providing, for each concise description of relevance, a separate paper that prominently identifies the item in the document list to which the concise description pertains will help ensure that the screener and the examiner can readily identify it. See Subsection IV.F below for more information regarding paper filing. At a minimum, a concise description of relevance must be more than a bare statement that the document is relevant because such a statement does not amount to a meaningful concise description. For example, the following statements, presented alone, would not be considered anything more than bare statements of relevance that do not rise to the level of meaningful concise descriptions: “Document 1 is relevant,” “See Document 1,” “Document 1 discloses/may disclose the invention,” and “Document 1 teaches the invention in Claim 1.” Additionally, a copy of the listed document that is merely annotated or highlighted will not be deemed a proper concise description of relevance. Further, concise descriptions of relevance that appear to be mere form paragraphs/letters in opposition to a general class of invention or technology will not be deemed proper concise descriptions of relevance. Third-party submissions that include unpublished materials as attachments to or inserted into the text of a concise description of relevance of a listed publication will be found to be non-compliant. For example, where a third party submits a publication for consideration, describes how a feature shown in an image from the publication is relevant, and inserts an image from a different source into the concise description to show details that are not visible or otherwise apparent in the published image, such submission would be deemed non-compliant unless the image from the different source was also published and separately listed for consideration. The statutory requirement for a concise description of relevance should not be interpreted as permitting a third party to participate in the prosecution of an application, as 35 U.S.C. 122(c) prohibits the initiation of a protest or other form of pre-issuance opposition for published applications without the consent of the applicant. Therefore, while a concise description of relevance may include claim charts (i.e., mapping various portions of a submitted document to different claim elements), the concise description of relevance is not an invitation to a third party to propose rejections of the claims or set forth arguments relating to an Office action in the application or to an applicant’s reply to an Office action in the application. Unlike the concise explanation for a protest under 37 CFR 1.291, which allows for arguments against patentability, the concise description of relevance required by 35 U.S.C. 122(e) is limited to a factual description of a document’s relevance. The concise description of relevance, therefore, does not permit third parties to submit arguments against patentability or set forth conclusions regarding whether one or more claims are patentable. In other words, the concise description of relevance must not rise to the level of a protest under 37 CFR 1.291. Element B Publication Y teaches a machine having element B of claim 1. See lines 1-3 on page 6 of publication Y. Publication Y teaches the benefits of using element B in this type of a machine. Element B The first embodiment also includes element B of claim 1. See lines 1-3 on page 6 of publication X. Thus, publication X anticipates claim 1 because it teaches all of the elements of claim 1. A concise description of relevance for a submitted document is not considered evidence but, rather, a statement of facts regarding the submitted evidence. Accordingly, the Office will not consider a declaration as evidence, where such declaration is submitted as a concise description of relevance for a document. Where a third party submits a declaration for the concise description of relevance, the concise description of relevance must not amount to an attempt at third-party participation in the examination of the application. 37 CFR 1.290(d)(3) requires submission of a legible copy of each item identified in the document list, other than U.S. patents and U.S. patent application publications. See37 CFR 1.98(a)(2)(ii) and MPEP § 609.04(a). Any copies of documents that are submitted in color will be scanned into black and white prior to entry of a compliant submission in the record of an application. There is no provision for the submission of copies of documents via compact disc or other electronic data storage medium. However, a third party may upload electronic copies of documents when using the Office’s dedicated Web-based interface to electronically file a third-party submission. See Subsection IV.E. below. 37 CFR 1.290(d)(1) provides for the listing of either entire documents or portions of documents. Thus, where only a portion of a document is listed as an item in the document list, a copy of that portion and not a copy of the entire document (e.g., where a particular chapter of a book is listed and not the entire book) must be submitted. Further, when a copy of only a portion of a document is submitted, copies of pages of the document that provide identifying information (e.g., a copy of the cover, the title page, the copyright information page, etc.) should also be submitted. Under 37 CFR 1.290(d)(3), copies of U.S. patents and U.S. patent application publications need not be submitted because such documents are readily accessible to examiners. 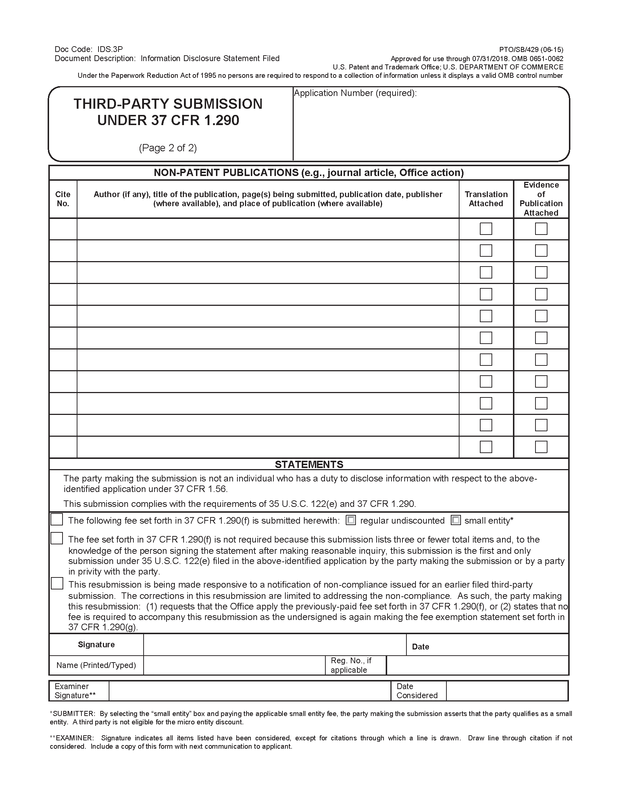 Whether filing a third-party submission under 37 CFR 1.290 in paper or electronically, it would be a best practice for third parties to include an identifying label for each item in the document list and place the identifying label on the accompanying concise description of relevance for the item, on the copy of the item (if submitted), and on the translation of the item (if submitted) so that screeners and examiners can more quickly identify the descriptions of relevance, copies, and translations that correspond to each item in the document list. Images of non-patent literature (NPL) cited in a compliant third-party submission will not be available for either viewing or downloading through Public PAIR. However, when entering a compliant third-party submission into an application file, the Office will separate the document list from the copies of the documents so that the identifying bibliographical information for the documents cited in the third-party submission will be visible in Public PAIR. The Office currently employs such a practice when entering IDS submissions under 37 CFR 1.98. 37 CFR 1.290(d)(4) requires an English language translation of any non-English language item identified in the document list. A translation submitted pursuant to 37 CFR 1.290(d)(4) may be a reliable machine translation and need not be certified. 37 CFR 1.290(d)(1) provides for the listing of either entire documents or portions of documents. Thus, where only a portion of a non-English language document is listed, a translation of the entire non-English language document must not be submitted. Rather, a copy of the listed portion of the non-English language document and a translation of only this portion must be submitted. 37 CFR 1.290(d)(5)(i) requires a statement by the party making the submission that the party is not an individual who has a duty to disclose information with respect to the application (i.e., each individual associated with the filing and prosecution of the patent application) under 37 CFR 1.56. Such statement is intended to avoid potential misuse of third-party submissions by applicants (e.g., by employing a third-party “straw man”) to attempt to circumvent the IDS rules. 37 CFR 1.290(d)(5)(ii) requires a statement by the party making the submission that the submission complies with the requirements of 35 U.S.C. 122(e) and 37 CFR 1.290. Additionally, to take advantage of the fee exemption, a third-party submission must be accompanied by the statement under 37 CFR 1.290(g). See Subsection IV.F. below for more information regarding the fee exemption. To facilitate compliance by third parties, form PTO/SB/429 and the dedicated Web-based interface for preissuance submissions include the statements required by 37 CFR 1.290(d)(5)(i) and (ii), as well as the statement under 37 CFR 1.290(g) (which can be selected if applicable). The Office will not entertain challenges to the accuracy of such statements because, pursuant to 37 CFR 11.18(b), whoever knowingly and willfully makes any false, fictitious, or fraudulent statements or representations to the Office shall be subject to the penalties set forth under 18 U.S.C. 1001. 37 CFR 11.18(b) applies to any paper presented to the Office, whether by a practitioner or non-practitioner. The Office cannot permit a third-party submission to be presented unsigned by the submitter in view of the signature requirement set forth in 37 CFR 1.4 for papers filed in a patent application, which require a person’s signature. Third-party submissions are required to be signed because 37 CFR 1.290(d)(5) and 37 CFR 1.290(g) (if applicable) require statements by the party making the submission. Thus, a third-party submission must be signed by the submitter, but there is no requirement to identify a real party in interest. A real party in interest can remain anonymous by having someone else make the third-party submission for them, but the submitter cannot remain anonymous. 37 CFR 1.290(f) requires payment of the fee set forth in 37 CFR 1.17(o) for every ten items or fraction thereof listed in the document list, except where the submission is accompanied by the statement set forth in 37 CFR 1.290(g). The Office will determine the item count based on the 37 CFR 1.290(d)(1) document list. Thus, if a U.S. patent or a U.S. patent application publication is identified in the document list, but a copy of the item is not submitted (i.e., because a copy is not required), the listed U.S. patent or U.S. patent application publication will be counted toward the document count. If a copy of an item is submitted but the item is not identified in the document list, the item will not be counted or considered and will be discarded. Additionally, if a third party identifies an item in the 37 CFR 1.290(d)(1) document list that is only a portion of a publication, the portion of the publication will be counted as one item. Further, while a third party is permitted to cite different publications that are all available from the same electronic source, such as a website, each such publication listed will be counted as a separate item. See Changes To Implement the Preissuance Submissions by Third Parties Provision of the Leahy-Smith America Invents Act, 77 Fed. Reg. 42150, 42163 (July 17, 2012) (final rule) for guidance on what constitutes a separate document on a website. When filing electronically, payment may be made by credit card, USPTO deposit account, or electronic funds transfer and the fee must accompany the submission at the time of filing. Credit card information for electronic credit card payments should be entered exclusively on the USPTO website providing electronic payment capability. When filing in paper, payment may be made by check, money order, credit card, or deposit account. Checks and money orders must be made payable to the Director of the United States Patent and Trademark Office. Credit Card Payment Form (PTO-2038) is available for making payment by credit card for paper submission. See www.uspto.gov/forms. To protect credit card information, form PTO-2038 must not be submitted electronically through EFS-Web. 37 CFR 1.290(g) provides an exemption from the 37 CFR 1.290(f) fee requirement where a third-party submission listing three or fewer total items is the first third-party submission by a third party, or a party in privity with the third party, in a given application. Where one third party takes advantage of the fee exemption in an application, another third party is not precluded from also taking advantage of the fee exemption in the same application as long as the third parties are not in privity with each other. To implement the fee exemption in 37 CFR 1.290(g) and avoid potential misuse of such exemption, exemption-eligible third-party submissions must be accompanied by a statement of the third party (i.e., “the party making the submission”) that, to the knowledge of the person signing the statement after making reasonable inquiry, the submission is the first and only third-party submission in the application by the third party or a party in privity with the third party. To preclude a third party from making multiple third-party submissions in the same application on the same day and asserting that each such submission is the first third-party submission in the application by the third party, the 37 CFR 1.290(g) statement requires that the submission be the “first and only” third-party submission. This statement will not, however, preclude the third party from making more than one third-party submission in an application, where the need for the subsequent submissions was not known at the time the third party filed the earlier submission that included the 37 CFR 1.290(g) statement. The third party would not be required to state in any such subsequent submission that the need for the subsequent submission was not known at the time the third party filed the earlier submission that included the 37 CFR 1.290(g) statement. Any such subsequent submission, however, would not be exempt from the 37 CFR 1.290(f) fee requirement. Where a third party receives a notification of non-compliance for a third-party submission, the third party may make necessary revisions to its submission, limited to addressing the non-compliance, and resubmit the now corrected submission provided the statutory time period for filing a third-party submission has not closed. The resubmission must be another complete submission, as the Office will not accept amendments to the non-compliant submission. See Subsection II. for content requirements for a third-party submission. To be complete, the appropriate fee for the number of documents being submitted (e.g., $180 for 1-10 documents) must accompany any resubmission made in response to a notification of non-compliance. However, to satisfy the fee requirement for a resubmission after a finding of non-compliance where the proper fee set forth in 37 CFR 1.290(f) accompanied the non-compliant submission, the third party may request that the Office apply the previously-paid fee to the resubmission. Similarly, to satisfy the fee requirement for a resubmission after a finding of non-compliance where the third party’s non-compliant submission of three or fewer documents was accompanied by the fee exemption statement set forth in 37 CFR 1.290(g), the third party may state that the fee exemption applies to the resubmission. The determination of whether the fee requirement for a resubmission is satisfied will be made at the sole discretion of the Office. A small entity discount is available for third-party submissions where applicable. To assert small entity status when filing in paper, a third party should select the “small entity” box on form PTO/SB/429 and pay the applicable small entity fee. By selecting the “small entity” box on form PTO/SB/429 (or equivalent) or the “small entity” link on the EFS-Web payment screen and paying the applicable small entity fee, the party making the submission asserts that the party qualifies as a small entity. A micro entity discount is not available for third-party submissions because a third party is not eligible for the micro entity discount. The following are examples of when a fee may or may not be required for a third-party submission. (4) a $360/$180 fee would be required where the first submission contains more than ten, but twenty or fewer total items, and so on (e.g., where the first submission contains twelve documents and the third party does not qualify for the small entity discount, a fee of $180 would be required for the first ten documents and a fee of $180 would be required for the remaining two documents, for a total fee of $360). (2) a $360/$180 fee would be required where the second or subsequent submission contains more than ten, but twenty or fewer total items, and so on. 35 U.S.C. 122(e)(1) and 37 CFR 1.290(a) limit the type of information that may be submitted in a third-party submission to patents, published patent applications, and other printed publications of potential relevance to the examination of a patent application. See MPEP § 2128 for guidance regarding printed publications. For example, a third-party submission may include U.S. patents and patent application publications, foreign patents and published foreign patent applications, as well as non-patent documents that qualify as publications, such as published articles, Office actions issued in published U.S. patent applications, and communications from foreign patent offices issued in published foreign patent applications. Documents that do not qualify as publications, such as materials that are subject to a court-imposed protective or secrecy order, trade secret information, unpublished internal documents of a corporation intended to be confidential, email correspondence not widely disseminated to the public, etc., must not be submitted for consideration under 37 CFR 1.290. Accordingly, third-party submissions cannot be submitted under MPEP § 724.02. Pursuant to 35 USC 122(e)(1) and 37 CFR 1.290(c), a third-party submission is required to be made in writing. Thus, published information, such as a the visual output of a software program or a video, may be submitted only if reduced to writing, such as in the form of screen shots, and evidence of publication provided if the date of publication is not known. Additionally, physical samples must not be submitted for consideration. Any physical samples submitted with a third-party submission will not be entered and will be discarded. Submissions filed pursuant to 37 CFR 1.290 will be reviewed for compliance before being forwarded to an examiner for consideration. During this review, the Office will determine if the documents submitted for consideration appear on their faces to be publications. If any of the submitted documents are found not to be a publication, the entire submission will be found non-compliant. In such a situation, the submission will not be entered into the patent application file or considered by the examiner and will be discarded. If a submission is determined to be compliant, the publications will be considered by the examiner and entered into the file as required by 35 U.S.C. 122(e). If the patent applicant, however, has evidence that a document filed by a third party is, in fact, not a publication, then the applicant can challenge the determination by the Office that the document is a publication, for example, in response to a rejection applying the document in question. In order for a submission to be compliant under 35 U.S.C. 122(e) and 37 CFR 1.290, each item submitted for consideration and inclusion into the file of a patent application must be a publication. Thus, 37 CFR 1.290(e)(4) requires that, if no publication date is known, the third party must provide evidence of publication. As a result, a third-party submission must either include items that are prima facie publications, or evidence that establishes that they are publications. In such situations, the third party may submit evidence in the form of affidavits, declarations, or any other appropriate format. Each item of evidence submitted will be evaluated with respect to both its authenticity and its persuasiveness. Evidence of publication must be specific to the document(s) submitted for consideration. Any affidavits or declarations submitted as evidence of publication must comply with the Office’s formal requirements. SeeMPEP § 715.04(II) (providing that “[a]n affidavit is a statement in writing made under oath before a notary public, magistrate, or officer authorized to administer oaths” and that a declaration “must include an acknowledgment by the declarant that willful false statements and the like are punishable by fine or imprisonment, or both (18 U.S.C. 1001 and must also “set forth in the body of the declaration that all statements made of the declarant’s own knowledge are true and that all statements made on information and belief are believed to be true.” [Note that a third party need not state “may jeopardize the validity of the application or any patent issuing therefrom.”]). Affidavits and declarations submitted as evidence of publication should explain how the affiant/declarant has personal knowledge of the facts described therein. Further, affidavits and declarations submitted as evidence of publication must be limited to facts establishing why a submitted document qualifies as a publication and must not to be used as a mechanism to place information that is not pertinent to establishing the document as a publication before the examiner. For example, a third party might submit a company’s undated marketing brochure for consideration with a declaration from an employee of the company stating that the employee attended a trade show on a particular date and distributed copies of the brochure being submitted for consideration to trade show attendees. In another example, if the third party had emailed the company’s undated marketing brochure to the members of a trade organization without restriction, a copy of the email might be submitted as evidence of publication. In a further example, a third party might submit as evidence of publication a printout from a website showing that the content of the website was publicly available at least as of the date retrieved shown on the printout, or screenshots from a website that establish the content of the website on a particular date. See Subsection II.A.2.c. for information on listing a document obtained from a website that archives Web pages. Such evidence will not be counted toward the item count for fee purposes, unless the evidence is in the form of a patent document or other printed publication and the evidence, itself, is listed and submitted for consideration by the examiner. In some instances, the copy of the document provided pursuant to 37 CFR 1.290(d)(3) may itself be the evidence, such as where a printout from the website showing the date the document was retrieved is provided to satisfy the copy requirement. See Subsection II.A.2.c. for information on listing a document where the actual publication date of the submitted document is not known. There is no requirement in 37 CFR 1.290(a) that the information submitted be prior art documents in order to be considered by the examiner. Further, 37 CFR 1.290(a) does not require a third party to indicate whether a listed document is or is not asserted to be prior art. For those documents where the date of publication is not apparent from a review of the document, the third party may provide information regarding the publication date of the document in its accompanying concise description of relevance. 37 CFR 1.290(a) does not prohibit third-party submissions that include patents, published patent applications, or other printed publications that are already of record in an application, where the submission is otherwise compliant. While it would be a best practice for third parties not to submit documents that are cumulative of each other or that are cumulative of information already under consideration by the Office, 37 CFR 1.290(a) does not explicitly prohibit cumulative submissions because it has been the Office’s experience that identifying purely cumulative submissions is difficult where a submission includes both a publication and a description of the publication’s relevance. A document submitted may appear on its face to be cumulative of information already of record, but its accompanying concise description of relevance may provide additional information with respect to the document, such that the submission of the document, together with the concise description of relevance of the document, is not cumulative of information already of record. For example, a submission would not be considered cumulative where it includes a document previously submitted by the applicant in an information disclosure statement and describes the document’s relevance to the examination of the application. In another example, a submission that includes documents cited in the background section of an application would not be considered cumulative if accompanied by concise descriptions of relevance that provide additional information regarding the documents. The standard under 37 CFR 1.290(a) for the documents submitted to be of “potential relevance to the examination of the application” is imposed by 35 U.S.C. 122(e)(1). This standard requires the submitter to believe the documents being submitted are relevant to the extent that the submitter can provide the concise description of the asserted relevance of each document submitted as required by 35 U.S.C. 122(e) and 37 CFR 1.290(d)(2). 35 U.S.C. 122(e) provides that any third party may submit for consideration and inclusion in the record of a patent application, any patent, published patent application, or other printed publication of potential relevance to the examination of the application. A third-party submission may be directed to any non-provisional utility application, design application, or plant application filed before, on, or after September 16, 2012. Any continuations, divisionals, and continuations-in-part of such applications (as applicable) are also eligible to receive third-party submissions. 35 U.S.C. 122(e) and 37 CFR 1.290 do not require that the application to which a third-party submission is directed be pending or published. A third-party submission made within the statutory time period, and otherwise compliant, will be entered even if the application to which the submission is directed has been abandoned. An examiner will not consider such third-party submission unless the application resumes a pending status (e.g., the application is revived, the notice of abandonment is withdrawn, etc.). Additionally, a third-party submission made within the statutory time period, and otherwise compliant, will be entered even if the application to which the submission is directed has not been published, for example, due to a nonpublication request filed under 35 U.S.C. 122(b)(2)(B)(i) and 37 CFR 1.213. 35 U.S.C. 122(e) provides for consideration and inclusion of third-party submissions in the record of a patent application, and limits such submissions to publications that are of potential relevance to the examination of the application. Thus, third-party submissions may not be directed to: (1) provisional applications, (2) issued patents, (3) reissue applications, and (4) reexamination proceedings. The Office will not accept third-party submissions in provisional applications as provisional applications are not examined by the Office. Additionally, the Office will not accept third-party submissions in issued patents. The provisions of 35 U.S.C. 301 and 37 CFR 1.501 provide an avenue for third parties who have a need to submit information in an issued patent. Further, third-party submissions are not permitted in post-issuance proceedings, including reexamination proceedings and reissue applications. See35 U.S.C. 302 and 35 U.S.C. 311 and MPEP § 1441.01 (“a reissue application is a post-issuance proceeding”). The protest provisions of 37 CFR 1.291 provide an avenue for third parties who have a need to submit information in a reissue application. See MPEP § 1441.01 (“the prohibition against the filing of a protest after publication of an application under 35 U.S.C. 122(c) is not applicable to a reissue application”). Further, where a third-party submission is directed to a reissue application and would otherwise be compliant under 37 CFR 1.290, the Office will enter the submission into the record of a reissue application as a protest under 37 CFR 1.291. 35 U.S.C. 122(e)(1) provides for “[a]ny third party” to file a preissuance submission. Thus, a third-party submission may be filed by any member of the public, including, for example, private persons and corporate entities. However, the third party must not be the applicant or any individual who has a duty to disclose information with respect to the application under 37 CFR 1.56. See 37 CFR 1.290(d)(5)(i). A third party does not need to be a registered practitioner to file a third-party submission. However, a registered practitioner may file a third-party submission on behalf of an unnamed real party in interest. If a third party wishes to remain anonymous, an attorney or other representative may submit a third-party submission on the third party’s behalf, but the submitter will need to be identified. See Subsection II.E above. Third parties are not required to serve the applicant with a copy of the third-party submission. By not requiring service of third-party submissions on the applicant, the Office is underscoring that such third-party submissions will not create a requirement on the part of the applicant to independently file the submitted documents with the Office in an information disclosure statement (IDS). Additionally, not requiring service of third-party submissions on the applicants will prevent challenges regarding whether service of a third-party submission was proper from negatively impacting the pendency of an application. 37 CFR 1.290(i) provides that the provisions of 37 CFR 1.8 do not apply to the time periods set forth in 37 CFR 1.290. See also 37 CFR 1.8(a)(2)(i)(A). Thus, third parties may not use a certificate of mailing or transmission in filing a third-party submission under 37 CFR 1.290. By not according a third-party submission filed by first class mail the benefit of its date of deposit with the USPS pursuant to a 37 CFR 1.8 certificate of mailing, the Office reduces the potential for papers crossing in the mail. That is, the requirement of 37 CFR 1.290(i) reduces the risk that a third-party submission, if it was permitted to rely on a certificate of mailing to be timely, would not be identified and entered until after an Office action is mailed. The requirement of 37 CFR 1.290(i) also encourages third parties to file third-party submissions at their earliest opportunity. The United States Postal Service (USPS) Priority Mail Express® service provisions of 37 CFR 1.10 do apply to a third-party submission under 37 CFR 1.290. See MPEP § 513 for guidance on the Priority Mail Express® service provisions of 37 CFR 1.10. The Office has developed a dedicated Web-based interface to permit third-party submissions under 37 CFR 1.290 to be filed electronically. Third parties can access the Web-based interface by using the Office's electronic filing system (EFS-Web) available at www.uspto.gov/ learning-and-resources/portal-applications. Registered and unregistered eFilers are able to select the “Third-Party Preissuance Submission under 37 CFR 1.290” option upon clicking the "Existing application/patent" radio button. See also the EFS-Web quick start guide for third party preissuance submissions (available at www.uspto.gov/sites/ default/files/QSG_Third_Party_Preissuance.pdf) for detailed instructions on filing third-party submissions electronically. Filing via EFS-Web is an electronic alternative to paper filing using form PTO/SB/429 (or equivalent). Instead of uploading the form, EFS-Web will automatically generate and complete the form after a third party enters all of the necessary information. Filing via the dedicated Web-based interface is the most efficient means of making compliant third-party submissions available to an examiner for consideration. Additionally, the Web-based interface will warn a third party if a submission appears to be untimely, as well as verify some of the content of a submission (e.g., U.S. patent data). Also, when filing a third-party submission electronically, a third party will receive immediate, electronic acknowledgment of the Office’s receipt of the submission. The electronic acknowledgment is not an indication that the third-party submission is compliant or has been entered; rather, it merely shows Office receipt of the submission. Note that a third party cannot electronically file a third-party submission without a Confirmation Number for the application, which can be obtained by looking up the application number in the Public Patent Application Information Retrieval (PAIR) System located at http://portal.uspto.gov/pair/PublicPair and viewing the Bibliographic Data. If the Confirmation Number is not available or not known, the third-party submission cannot be filed electronically and instead must be filed in paper. The EFS-Web Legal Framework prohibited third-party submissions under former 37 CFR 1.99 from being filed electronically in patent applications because documents filed electronically via EFS-Web were instantly loaded into the Image File Wrapper (IFW). See Legal Framework for Electronic Filing System—Web (EFS-Web), 74 FR 55200, 55202, 55206-7 (October 27, 2009). Third-party submissions under 37 CFR 1.290 that are filed electronically via the dedicated Web-based interface for preissuance submissions in EFS-Web, however, will not be instantly loaded into the IFW. Thus, third-party submissions under 37 CFR 1.290 are permitted to be filed electronically via the dedicated Web-based interface for preissuance submissions because such submissions will be screened for compliance with the requirements of 35 U.S.C. 122(e) and 37 CFR 1.290 before being entered into the IFW of an application. Note that protests under 37 CFR 1.291 are still prohibited from being filed electronically in patent applications. Electronically-filed third-party submissions not made via the dedicated Web-based interface for preissuance submissions are prohibited and will be discarded (i.e., a third party must select the “Third-Party Preissuance Submission under 37 CFR 1.290” option in EFS-Web when filing electronically and not the “Document/Fees for an existing application/proceeding” option, which is only available for the applicant or applicant’s representative). Further, applicants must not file follow-on papers in their applications via the dedicated option for third-party submissions. Additionally, third-party submissions may be filed in paper via first-class mail, United States Postal Service (USPS) Priority Mail Express® service pursuant to 37 CFR 1.10, or delivery by hand. Instructions for filing a third-party submission in paper using form PTO/SB/429 (or equivalent) are located at www.uspto.gov/sites/ default/files/documents/3prsubmission_instructions.pdf. Pursuant to 37 CFR 1.6(d)(3), third-party submissions may not be filed by facsimile. Facsimile transmissions, although not subject to the delay associated with first class mail, are often received in poor quality, which may result in illegible content and cause the submission to be found non-compliant. Because facsimile transmission of third-party submissions under 37 CFR 1.290 is not permitted, the use of a certificate of transmission pursuant to 37 CFR 1.8 is not applicable to third-party submissions. When filing a third-party submission in paper, a third party may include a self-addressed postcard with the submission to receive an acknowledgment by return receipt postcard that a third-party submission has been received. The return receipt postcard is not an indication that the third-party submission is compliant or has been entered; rather, it merely shows Office receipt of the submission. Where a third-party submission is filed in an unpublished application, a returned postcard acknowledging receipt will not indicate whether such application in fact exists or the status of any such application because, pursuant to 35 U.S.C. 122, original applications are kept in confidence unless published under 35 U.S.C. 122(b) or available to the public pursuant to 37 CFR 1.14(a)(1)(iv), (v), or (vi). Thus, unless a third party has been granted access to an original application, the third party is not entitled to obtain from the Office any information concerning the same, including the mere fact that such an application exists. Electronic filing via the dedicated Web-based interface is the most efficient means of making compliant third-party submissions available to an examiner for consideration, as compliant third-party submissions filed in paper will experience a delay in entry due to the additional processing required for scanning and indexing of paper submissions into electronic form. Additionally, third parties filing third-party submissions electronically via the dedicated Web-based interface will receive immediate, electronic acknowledgment of the Office’s receipt of the submission, instead of waiting for the Office to mail a return receipt postcard when provided with a paper submission. The involvement of a third party in filing a submission under 37 CFR 1.290 ends with the filing of the submission. The third party filing the submission will not receive any communications from the Office relating to the submission other than the electronic acknowledgement receipt (see Subsection IV.E. ), the return of the self-addressed postcard (see Subsection IV.F. ), or a notification to the third party regarding its third-party submission (see Subsection VI.A.1.). A third party is not permitted to contact the examiner. Questions regarding a third-party submission may be directed to the AIA help telephone (1-855-HELPAIA) or AIA email (HelpAIA@uspto.gov), or to the point of contact listed on a notification to the third party regarding its third-party submission. Further, because the prosecution of a patent application is an ex parte proceeding, a third party is not permitted to respond to an examiner’s treatment of the third-party submission in the application (see Subsection VI.B.). Third-party submissions, whether submitted in paper or electronically via the dedicated Web-based interface, will not be automatically entered into the electronic image file wrapper (IFW) of an application, i.e., will not be made of record in the application. Instead, third-party submissions submitted by third parties will be reviewed by the Office to determine compliance with 35 U.S.C. 122(e) and 37 CFR 1.290 before being entered into the IFW. The Office has established procedures to complete its compliance determination, for both paper and electronic submissions, promptly following receipt of the submission so that compliant third-party submissions will be quickly entered into the IFW and made available to the examiner for consideration. Third-party submissions filed in paper, however, will incur more processing delay than submissions filed electronically via the dedicated Web-based interface for preissuance submissions due to the scanning and indexing process. Each Technology Center (TC) has designated points of contact for screening third-party submissions made in applications docketed to the respective TCs. 37 CFR 1.290(a) provides that a third-party submission may not be entered or considered by the Office if any part of the submission is not in compliance with 35 U.S.C. 122(e) and 37 CFR 1.290. The Office will enter a third-party submission that is compliant with both 35 U.S.C. 122(e) and 37 CFR 1.290; however, any part of a third-party submission that is non-compliant with respect to the requirements of 35 U.S.C. 122(e), whether or not the third-party submission is otherwise compliant with 37 CFR 1.290, will prevent entry of the entire third-party submission into the record. By contrast, a third-party submission that is compliant with 35 U.S.C. 122(e), but non-compliant with some requirement of 37 CFR 1.290, may be entered into the record if the error is of such a minor character that, in the opinion of the Office, it does not raise an ambiguity as to the content of the submission. For example, if an error with respect to a requirement of 37 CFR 1.290 is of such a nature that the content of the third-party submission can still be readily ascertained (e.g., a U.S. patent is identified by the correct patent number and issue date but the name of the first named inventor is clearly misspelled), the Office may have enough information to be able to enter the third-party submission into the record despite the error. However, the determination of whether to enter or not to enter a submission that partially complies with a requirement of 37 CFR 1.290 will be made on a case-by-case basis and at the sole discretion of the Office (e.g., the Office may decline to enter a third-party submission listing a U.S. patent whose patent number does not match Office records with respect to that patent number’s issue date and/or first named inventor). In any event, the Office will either enter or not enter the entire submission and will not attempt to enter portions of partially compliant submissions. Non-compliant third-party submissions, except those submissions having a non-compliance of minor character noted above, will not be entered into the IFW of an application or considered, and will be discarded. Also, the Office will not refund the required fees in the event a third-party submission is determined to be non-compliant. The statutory time period for making a third-party submission will not be tolled by an initial non-compliant submission. The Office will not set a time period for a third party to file a corrected third-party submission. Additionally, the Office will not accept amendments to a non-compliant submission that was previously filed. Instead, a third party who previously filed a non-compliant submission may file another complete submission, provided the statutory time period for filing a submission has not closed. See also Subsection II.F.2. (fee is required for a resubmission after a finding of non-compliance). A third-party may request a courtesy electronic mail message (email) notification in the event their third-party submission is found to be compliant or non-compliant. Such request may be made when filing electronically by selecting the appropriate check box and entering an email address to which the notification should be directed in the “Request for Notification Regarding Third-Party Preissuance Submission” section of the Office’s dedicated Web-based interface for preissuance submissions. 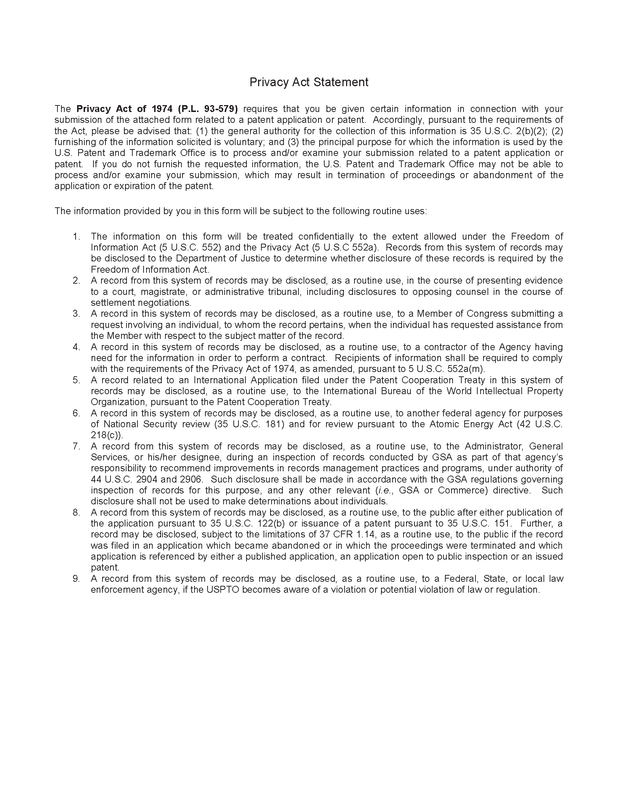 Such request may be made when filing in paper by including a separate paper with the third-party submission clearly titled “REQUEST FOR NOTIFICATION REGARDING THIRD-PARTY PREISSUANCE SUBMISSION” and clearly indicating the email address to which the notification should be directed. A notification of non-compliance will include the reason(s) for non-compliance (e.g., no concise description of relevance was provided for a listed document, the concise description of relevance for a listed document was improper, the submission was not timely, etc.). The non-compliant third-party submission will not be made of record in the application. No notification will be issued where a third party does not provide an email address with the submission. Further, no notification will be issued where the third-party submission is directed to an unpublished application. See Subsection IV.F. (unpublished patent applications preserved in confidence). The notification to the third party will not be made of record in the application. Further, the Office does not intend to enter the email address provided for notification into the record of the patent application. An applicant will be notified upon entry of a compliant third-party submission in their application file where the applicant participates in the Office’s e-Office Action program, and the contents of a compliant third-party submission will be made available to the applicant after it has been entered in the IFW of the application. An applicant may view non-patent documents identified in a third-party submission document list via the Office’s private Patent Application Information Retrieval (PAIR) system. The applicant will not be notified of a non-compliant submission. 37 CFR 1.290(h) provides that in the absence of a request by the Office, an applicant need not reply to a third-party submission under 37 CFR 1.290. Where the Office believes information from applicant is needed, the Office may issue a requirement for information pursuant to37 CFR 1.105. Once a third-party submission has been screened and found compliant, the submission will be entered into the IFW for examiner consideration. The examiner should consider the listed publications and accompanying concise descriptions in the third-party submission in the same manner as information in an information disclosure statement (IDS), generally before issuing the next Office action. Entry of a third-party submission does not expedite the application. During examination, the examiner should sign form PTO/SB/429 (or equivalent) in the same manner as an IDS to indicate all the items and their concise descriptions have been considered. The examiner’s signature does not indicate the examiner agrees with the third party’s position regarding the publication, but only that the examiner considered the submission. Further, the examiner should clear the submission’s IDS flag in PALM and provide a signed copy of the PTO/SB/429 with the next Office action. There is no need for the examiner to comment on the submitted documents or the concise descriptions of relevance in the Office action. However, the examiner should apply the information as deemed necessary (i.e., in a rejection of a claim). Also, the applicant need not respond to the third-party submission in the absence of a request by the Office to do so. See37 CFR 1.290(h). Where the examiner believes information from the applicant is needed, the examiner may issue a requirement for information pursuant to 37 CFR 1.105. In no circumstance may an examiner direct a requirement for information to the third party that submitted the paper under 37 CFR 1.290. Further, because the prosecution of a patent application is an ex parte proceeding, no response from a third party with respect to an examiner’s treatment of the third-party submission will be permitted or considered. Documents from a third-party submission that were considered by the examiner will be printed on the patent, similar to the way documents from an IDS that were considered by the examiner are printed on the patent. Documents cited by third-parties under 37 CFR 1.290 will be distinguished on an issued patent from documents cited by the applicant and by the examiner.